The industrial hygiene professionals at Clark Seif Clark (CSC) offer consulting, training and testing services to identify and mitigate workplace hazards. This list changes little from year to year and represents thousands of instances where workers could be injured or killed and millions of dollars in noncompliance penalties. Protecting the health and safety of the U.S. workforce has improved over the years, but as recently as 2015, the Occupational Safety & Health Administration (OSHA) reports that over 4,800 workers were killed on the job. This is a dramatic improvement from the estimated 14,000 workers killed on the job each year before the creation of OSHA back in 1971. In addition to these fatal injuries, millions of workers are injured on the job annually. Under the Occupational Safety and Health Act of 1970, employers are responsible for providing “safe and healthful working conditions” for their employees. To help prevent occupational injuries, illnesses and fatalities, there are a number of OSHA regulations that are enforced by the agency. Companies and institutions that fail to meet OSHA health and safety regulations can be subject to costly noncompliance fines. 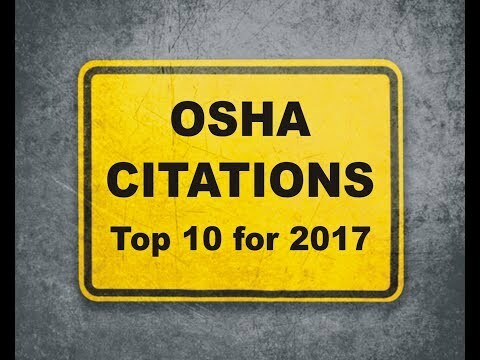 In an effort to help improve workplace safety, OSHA annually releases a list of the 10 most frequently cited safety and health violations for the fiscal year. The list is compiled from tens of thousands of workplace inspections conducted by their staff. To learn more about this or other industrial hygiene, occupational, environmental, indoor air quality, health and safety services, please visit www.csceng.com, email csc@csceng.com or call (800) 807-1118.